After years of research JTP Machinery have carefully selected an experienced and reliable Chinese tractor manufacturer to create their own range of JTP Series Tractors. JTP Machinery have gone to great lengths to ensure that their tractors are reliable and trouble free and, with their back up, customers will be sure to get a tractor that is both value for money as well as reliable, safe and easy to use. JTP Machinery take after-sales service and spare parts back up seriously and have all of the important spare parts in stock, which means customers won't be left in the lurch when it comes to needing filters, warranties or repairs. The JTP Series Tractor warranty covers all major components with a full parts and labour warranty. On top of this the company's qualified Plant Machinery mechanics have the training and experience to solve problems properly, with the right parts and equipment. JTP Machinery spent a great deal of time testing the models in their JTP Series Tractor range, ironing out any problems they could find by pushing the test machines to their limits while working closely with the factory in China to solve any issues that arose. It has been ensured that all the filters used on the JTP Series Tractors are good quality filters readily available in Australia and all the oils are changed to make sure they are clean and of high quality. In addition to this a list of important adjustments and changes are made before the machines are sold. 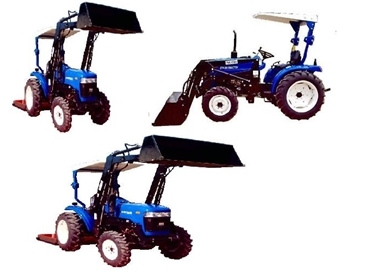 Customers will find that these tractors have large slow revving diesel engines that start easily and last a long time, the transmissions are large, strong and simple, and the bonnets open at the front with gas struts to hold them open allowing ease of access to the engine. In general JTP Series Tractors are simple and strong. At this point machines are only available within a 200km radius of the workshop, so a tight rein can be kept on the tractors.